The Port of Corpus Christi is riding a wave of economic momentum. 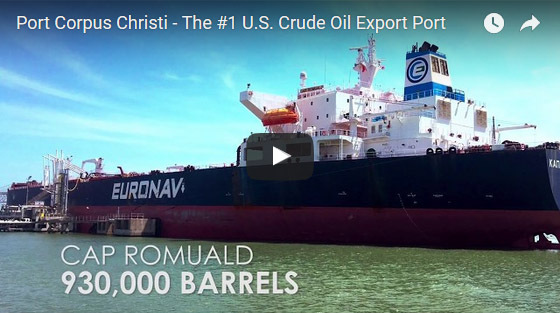 Today the Port of Corpus Christi is the #1 exporter of U.S. produced crude oil in the nation. Exports create jobs here in the United States. With rising global demand, the Port of Corpus Christi is ideally positioned to serve the energy needs of the United States, and the world. Corpus Christi is close to both the Eagle Ford Shale, which extends deep into Mexico, and the Permian Basin; the nation’s largest crude oil producing region. Currently around 2.3 million barrels per day flows from the Permian Basin where output is expected to increase to 3.6 million barrels per day by 2022. The majority of proposed pipelines from the Permian Basin will flow straight to the Port of Corpus Christi’s docks.